DEFUNIAK SPRINGS — Virginia King Jernigan, 84, of Lakeland, died Friday in Lakeland. 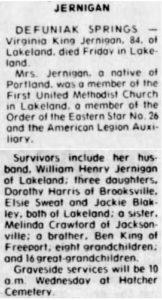 Mrs. Jernigan, a native of Portland, was a member of the First United Methodist Church in Lakeland, a member of the Order of the Eastern Star No. 26 and the American Legion Auxiliary. 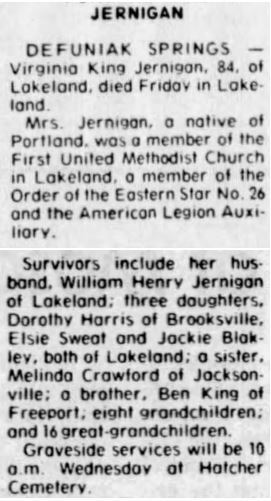 Survivors include her husband, William Henry Jernigan of Lakeland; three daughters, Dorothy Harris of Brooksville, Elsie Sweat and Jackie Blakley, both of Lakeland; a sister, Melinda Crawford of Jacksonville; a brother, Ben King of Freeport; eight grandchildren; and 16 great-grandchildren. Graveside services will be 10 a.m. Wednesday al Hatcher Cemetery.